This is Gregory’s first venture into the world of Young Adult. I know she can write adult historical fiction novels I love, so I decided to give her Young Adult novel a try and see if she could write that genre as well. As it turns out, she can. 17-year-old Luca has grown up in the monastery, but when he starts asking questions, he’s cast out and accused of heresy. He is recruited by a mysterious order to travel and investigate the evils and dangers people are seeing in the world around them. He must do as he is told and not question his orders, although in his role of inquisitor he will be asking many questions of others. He agrees to become a part of the order; understanding that he is one step away from death and this is his salvation. Isolde is only 17 when her father dies, leaving her to her brother’s care. Despite being raised to know how to run the home just as well as any man, upon his death her father had changed his will to say she would either marry or be sent to the nunnery. She choses to be sent to the nunnery, but as soon as she arrives, strange things begin to happen that make everyone in the nunnery frightened. It is these strange occurrences that bring Luca to Isolde, but it is a respect for each other and the truth that keeps them together. I’m glad there’s a slow build between these two. I think anything else wouldn’t feel right, especially given the time period in which the story takes place. I think I can see where this relationship is going and I think I’m going to like it. The plot is interesting and has me drawn in. I want to see where Luca and Isolde travel and what they face. There were only a couple inquisitions in this novel, but Luca clearly has a level head and thinks things out before taking action. He might be serving the Pope, but he is not going to let emotions cloud his judgment. It will be interesting to see where Gregory takes these characters next. 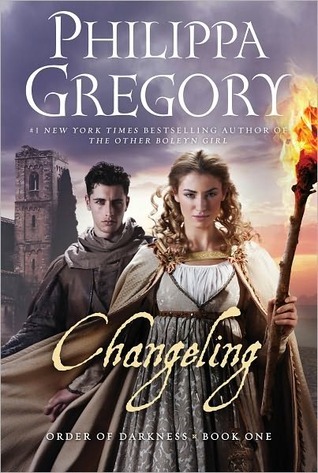 Changeling is Gregory’s first Young Adult novel, but not her first historical fiction. I knew she’d be able to get the historical feelings across, and I’m happy to say she can write Young Adult just as well as she writes for adults. Gregory has proved, once again, why she’s one of my favorite authors to read. This entry was posted in Historical Fiction, Mystery, Thriller, and Suspence, Something a Little Different, Young (and New) Adult and tagged Fantasy, Historical Fiction, Mystery/Thriller, Paranormal, Philippa Gregory, Young Adult.